The magical world of Cicely Mary Barkers series of Flower Fairies books has captured the imagination of romantics since first published in 1923. Her unique combination of artistic whimsy and scientific study create an irresistible world of delicate flowers and the fairies who live among them. 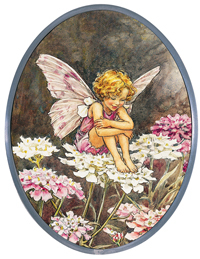 The Candytuft Fairy brings wonderful sweets to the fairy parties. Her specialty is a seed and honey candy as small as a fingernail. She daydreams among the pink and white blossoms of the Candytuft flowers (scientifically known as Iberis amara), portraying the delicate beauty of children, flowers and the season of spring itself.